1319-1364) Jean II, also called John the Good, was a monarch of the House of Valois who ruled as King of France from 1350 until his death. When Jean II came to power, France was facing several disasters: the Black Death, which caused the death of nearly half of its population, free companies of routiers who plundered the country, and English aggression that resulted in disastrous military losses. 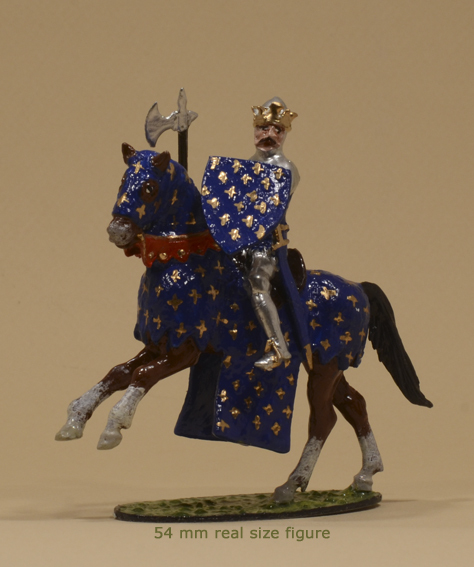 In July 1356, Edward, the Black Prince, took an army on a great chevauchée through France. Jean II pursued him with an army of his own. In September a few miles southeast of Poitiers, the two forces met. On the day of the Battle of Poitiers, Jean II and 19 knights from his personal guard dressed identically. This was done to confuse the enemy, who would do everything possible to capture the sovereign on the field. In spite of this precaution, Jean was captured. 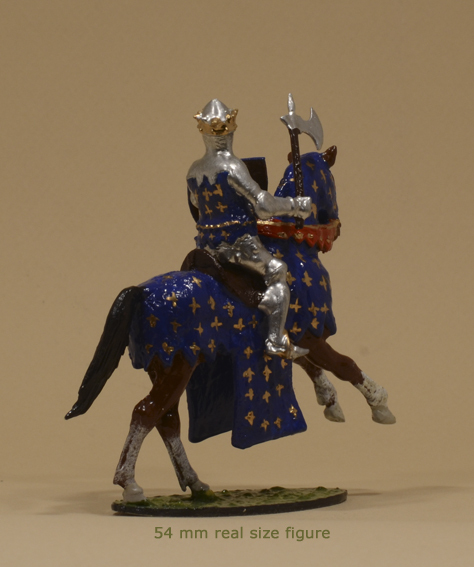 Though he fought with valor, wielding a large battle-axe, his helmet was knocked off. Surrounded, he fought on until Denis de Morbecque, a French exile who fought for England, approached him. "Sire, "Morbecque said. "I am a knight of Artois. Yield yourself to me and I will lead you to the Prince of Wales”. King Jean surrendered by handing him his glove. That night King Jean dined in the red silk tent of his enemy, the Black Prince attended to him personally. He was then taken to Bordeaux, and from there to England.